Explore a bela região da Arrábida neste passeio privado de meio dia ou de dia inteiro a partir de Lisboa. Após o embarque no seu hotel, você viajará de carro particular para o interior de Portugal e para o delicioso Parque Natural da Arrábida. 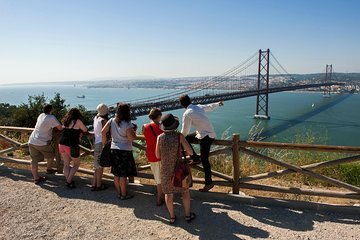 Suba uma torre mourisca na pequena cidade de Palmela; saborear safras locais em uma vinícola de propriedade familiar; e pare ao longo do caminho para ver o monumento a Cristo Rei e muito mais. The guide was great, and very accommodating! He had a good relationship with the tour guides at wineries, and was very knowledgeable about the history of the region. We were able to see many things without feeling rushed. Highly recommend! There was four in our party, the morning half of the trip was very good and the winery we visited was very generous with their sampling. We ordered a wonderful cheese, very inexpensive to go with our wine. A wonderful experience even at 11 am. The afternoon winery although large and well known served so so samples. Lunch at the fishing village was excellent. Family owned and very reasonable. Beautiful. I recommend the morning trip only. This was truly a private tour and we had a great time wine tasting and enjoying a tasty seafood lunch in sesimbre.... Would recommend doing this tour as it takes you off the beaten tourist path and into the local flavor of portugal. Our guide, Gustav, was very lively and had some great stories to share with us as we passed through the country side seeing the various landmarks. We enjoyed this tour very much. Luis was an excellent guide. Excellent we had a private tour for just the two of us. Guide was very good and the tour was a great way to see a little outside of Lisbon. Excellent .. just excellent. Gus was a great guide. Vineyard was superb.